Ian Goddard, a part of the OLLI at Duke family since 2002, has led a life of avontuur—the Afrikaans word for adventure. His rich and adventurous life has provided him with a unique perspective, a personal journey, and many incredible stories to tell. 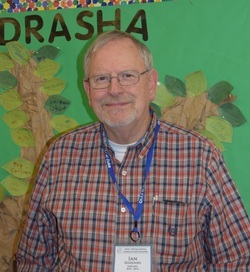 Ian was born in Johannesburg, South Africa in 1943. He grew up in Vereeniging, a small town on the outskirts of Jo’burg in a large extended family of some prominence. His father owned a small engineering business doing work for local farmers, and his mother was a homemaker. Vereeniging was a small industrial city, located on the Vaal River, and surrounded by an endless veld, making it dry, dusty, and cold in the winter and hot, humid, and wet in the summer. The veld, fields of grassland and bush that bordered the village, allowed a young, inquisitive, barefoot boy with a vivid imagination everlasting days of avontuur. The home Ian remembers most was his grandparent’s; it was a red brick rambler, covered in ivy, and hidden from view behind a tall hedgerow. The spacious well-manicured lawn separated it from the road, and the residence boasted a bountiful grape arbor, a rose garden, and a large overhanging tree that grew at the front gate. “The place of my early youth was magical, at least in my memory,” said Ian. “The house was usually busy, besides eight uncles and aunts, we had servants that were considered a part of the family. There were big dogs, four or five Bullmastiffs. And I can still see my grandfather, a big man, light complexioned, and usually dressed in a suit. He was the manager of a steel company that produced armaments for the allies during World War II. We lived in post-colonial South Africa, the local tribes often engaged in conflict and disagreement. My grandfather was good at neutralizing the disputes on the job between the rival tribesmen who worked for him. Ian was most influenced by family and people who were characterized by intelligence, diligence, honesty, humbleness, and integrity. He adopted these traits for himself and in 1958, at the age of 15, he became the youngest recruit in the history of the South African Navy; within months after he enlisted, South Africa gained its independence, and the Royal Navy became the South African Navy. The new Apartheid government soon put an end to his dreams of travelling the world, obtaining prestige and a superior training---a future as a naval officer. He returned home to complete his education and acquired a certification in Production Management. Ian’s work in construction management and engineering was an adventure in itself; every few years added a new chapter to an evolving career. He first arrived in America at the same time as the first moon landing in 1969. He’d intended to stay in the States briefly and have a little avontuur, but one job led to another, and then a lifetime of jobs, family, and living. Ian, his wife, and two sons relocated to South Africa from 1988 to 1991 thinking it might be a permanent move only to discover that South Africa was no longer the place of his youth, and Ian had become an American with the spirit of South Africa alive within him. Accepting change and challenge, Ian managed to land on his feet over in a work environment that was clearly cyclical, dynamic, and buffeted by external events. It was a time of strong industrial growth and as the industry ebbed and flowed, he found his skills well aligned. The last years of his career were spent traveling the world, managing foreign projects in China, London, and the Middle East. In 2002, Ian and his wife Karen moved to Durham. It was a serendipitous move for the Goddards and for OLLI! They met the then director of DILR, Sara Craven, at a musical event, and Ian’s collaborative association with OLLI became history. He has taught several classes on South Africa: the Anglo-Zulu Wars, The Anglo-Boer War, The Life and Legend of Nelson Mandela, and led a group of OLLI members on a tour of South Africa in 2007. More recently, he’s taught classes on iTunes, moderating the World Today, and he currently facilitates TED Talks. Ian received the Certificate of Appreciation for teaching 25+ courses in January 2015. “What would surprise others most about you?” I asked. Whether it is in a classroom with OLLI, at home with a good book, or roaming the bushveld of the Kruger, Ian Goddard will find the adventure in it.